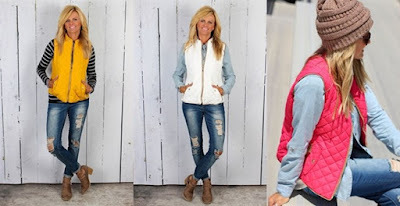 I ♥ these Quilted Vest JUST $22.99 (Retail $42.99). Our diamond-quilted mixed-media vest has comfort and style. Stand collar with ribbed-knit lining. Two-way zipper. On-seam pockets with snap closure. Pocket flaps and back yoke. Perfect for the cooler weather, you can wear this chic vest whenever you need an extra layer in the city or country alike.